The Long Version: The recent press notwithstanding, the Toyota Prius is one of the best hybrid automobiles on the road today. 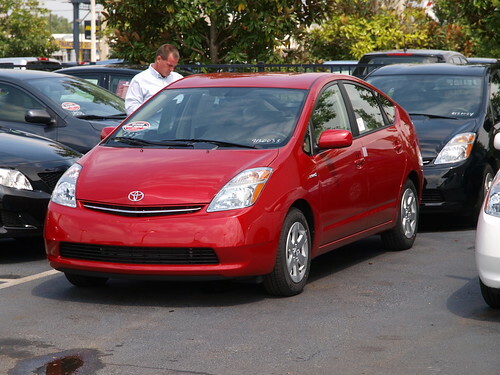 This is my review of the 2009 Toyota Prius after 11 months and 18,000 miles. 2009 was the last year that the second generation Prius was manufactured. I got my copy in April 2009 due to the convergence of a number of circumstances; the local economy was pretty bad, which meant that the local Toyota dealership had unsold Prius' sitting on their lot, and the 2010 model had been announced, further depressing sales of existing 2009s. Finally, we'd walked onto the Toyota lot after a less-than-satisfactory experience trying to purchase a Honda 2010 Insight. The wife and I were in the market to purchase a high-efficiency vehicle for me to use as a commuter car. I drive around 55 miles round trip to work during the week. Before the Prius I was driving a 2003 Kia Sorento. When I bought that car in 2002 gas was going for 88 cents/gallon. That price rose drastically over the years, through the 2004 and 2005 price shocks due to hurricanes, topped by the 2008 price shock due to the speculative bubble in the commodities markets. By mid-2008 gas in Orlando reach $4.14/gallon. It took between 19 and 20 gallons/week to fill the thirsty Sorento, so at gasoline's peak price I was spending $80/week to fill the car, or $320/month. Add to that the cost of gas for my wife's van and my two girl's cars, and I was spending $600/month for gas for the entire family. We'd been looking at the Prius long before the 2008 gas spike. We'd been reading about the Prius' high gas mileage and excellent quality for years in the pages of Consumer Reports (CR), where CR has consistently rated the Prius as Recommended year in, year out. 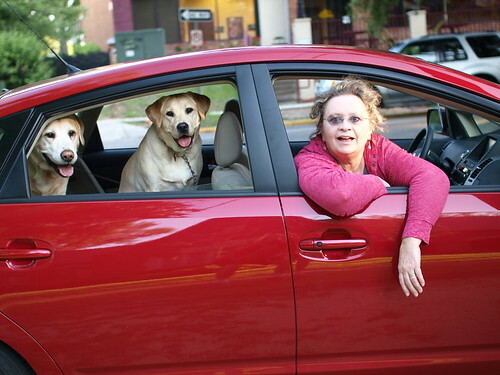 Before we bought in 2009 we'd gone to look at earlier models, and take them out for a drive. But we'd look at the family finances and come to the conclusion "not yet." But with what we went through from 2004 to 2008, we were more than ready. We just needed the right deal, and that came our way in April 2009. From a practical standpoint the Prius is big and roomy on the inside. It's more than comfortable for four adults (like myself, my wife riding shotgun and my two adult daughters in the back). With the rear seats folded down it has a lot of rear cargo space, more than enough for two Labs, a week's worth of luggage for the wife and I (Labs don't need much, just their sleeping mats, their retractable leads, and puppy chow), and my Olympus camera gear. It's a great little touring car especially for tooling around Florida. Gas mileage is great in my Prius, higher than the published 48 mpg highway/45 mpg city/46 mpg combined. With my driving I get 50 or more combined mpg. This value is on dry pavement in reasonable weather. When it's wet (summer rainy season) or if it's very windy (winter dry season) the combined mpg drops down to around 47. But that's still higher than published specs. What makes it easy to hit higher-than-published mpg values is the center console that came on our model. The center console is a color LCD screen. 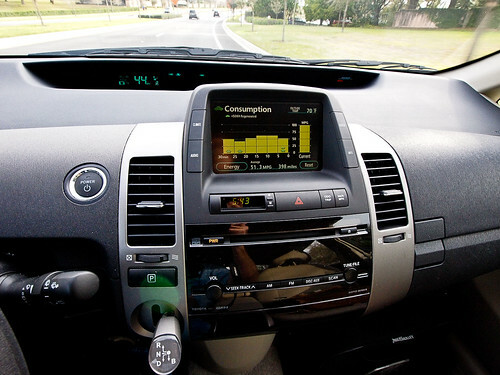 It performs a number of tasks, such as showing instantaneous and average MPG (Consumption), how the electric and gas motors are operating with the battery (Energy), setting the air conditioning (Climate), picking your radio station (Audio), and showing a live-view of the back of the vehicle when placed in reverse. When not in reverse, the display defaults to Consumption. 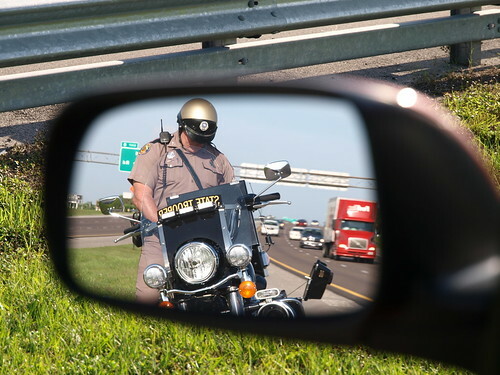 If you pay attention to the Consumption display out of the corner of your eye, you start to drive like you play video games; you try to operate the vehicle to get the highest score (mpg) without earning the undying wrath of your fellow drivers. I'm no hypermiler, but I've learned not to bolt off the starting line after a stop, to slowly and evenly come up to speed, to coast whenever possible and as soon as possible, and to drive at or below the speed limit. I drive the speed limit on the side roads and city streets, while I keep the highway speeds at 65 or lower. 65 mph isn't the best highway speed (60 is), but anything over 65 leads to a 45mpg (or lower). All of this helps me hit my target mpg of 50. More than 50 is icing on the cake. Earlier I wrote that during the gas spike of 2008, when gas was over $4/gallon, I was spending $80/week to fill my Sorento. With gas hovering near $3/gallon right now, I'm spending $80/month to keep the Prius filled, or what it cost to fill the Sorento in 2002. Yes, I've got a monthly car note I need to service, but a goodly chunk of that is being offset by the gas I'm not having to buy. While most associate speed with noise, the Prius is unusually quiet, even when it's going very fast. Just how fast? Fast enough, quickly enough, quietly enough to land you into trouble if you're not paying attention to the posted speed limit. As a consequence I've developed the automatic habit of using cruise control, even on side roads and long stretches of city streets between stops. My Prius is red, and statistics show that police love to ticket speeding red autos more than just about any other. I might as well paint signs on mine saying "Catch me, please." Remember, kids, cruise control is the most important feature of the car. Would I buy another Prius? You bet I would. I've owned many brands over the years, and in spite of the current rash of trouble that has rained down on Toyota over sticking accelerators, I'm here to assure you that I'd rather have the worst of Toyota over many other manufacturer's best. The Prius has proven that it's safe, reliable, and a distinct pleasure to drive. The Prius may not be the cheapest, the biggest, the fastest, or the sexiest to drive, but with the right handling and the right attitude the Prius is the best overall automotive investment you can make right now. And as gas prices in central Florida continue their slow inexorable rise to $3/gallon and higher, my April 2009 investment is making better and better sense every day.